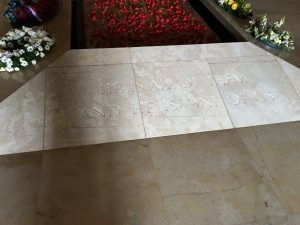 Engraved in the marble at the tomb of the unknown soldier at the Australian War Memorial are the words, “He is all of them and he is one of us.” The remains of this unknown Australian soldier, who died in the First World War are laid to rest in the hallowed Hall of Memory. The words remind us that he is representative of “all of them”, the men and women who have served Australia in various theatres of war. They fought to preserve the freedoms that we enjoy in Australia and he represents those who have given their very lives in that service. The words also remind us that he is “one of us”. An Australian, yes. But more than that. He was a citizen of this world. A part of humanity. This unknown soldier could just as easily have been me. Or you. He could have been your grandfather. Or your mother. Your sister. Your nephew. Your great aunt. His anonymity is key to understanding his significance. We don’t mourn his character, his virtues, his courage or his righteousness, because we don’t know if he possessed any of those elements. English clergyman and poet John Donne in the 1600s wrote “any man’s death diminishes me, because I am involved in mankind” (Meditation XVII). We grieve for the soldier because his death is a loss from this world. What once was, is no longer. We grieve for the human condition. We mourn for our mortality and we long for immortality. We wish that no one had to die. He is one of us. And he is gone. Yet in that very lesson, is an encouragement for us today. For if I mourn the loss of a man I never knew, then I have come to understand that every person has a valuable place in our world. All people make up the wonderful tapestry of humanity, weaving their part in colours bright and in subtle textures. Each one of us has a role, we are all actors in the drama of life. I am a part of humanity, a citizen of this world. I am involved in mankind. I am one of us. Which is better – pre-paid funerals or funeral insurance?